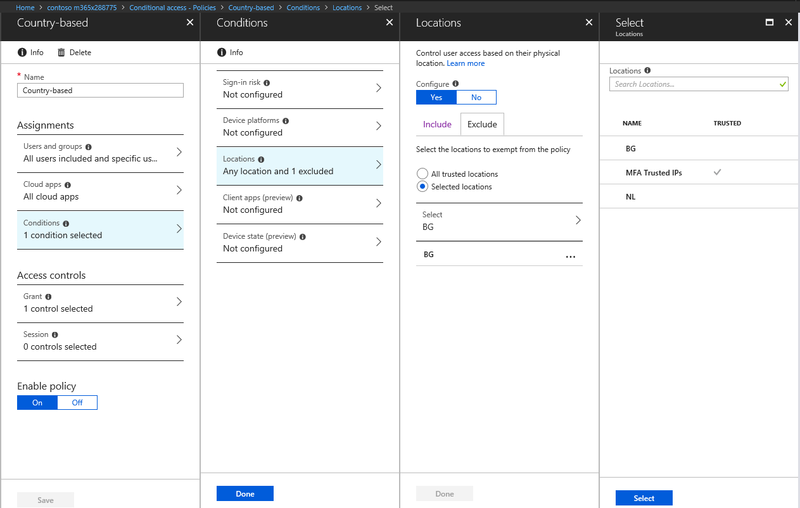 Quietly, Microsoft has released (a preview version of the) country-based controls for Conditional Access. 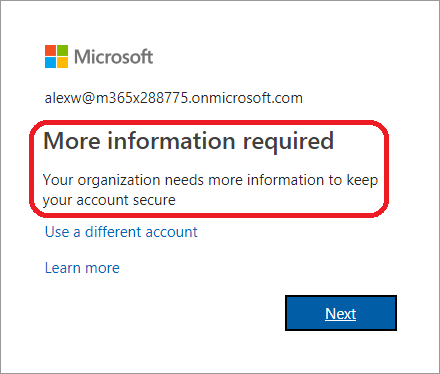 While this is technically a minor addition, the ability to block logins to Office 365 or other cloud applications based on the location of the user has been a common request for years. Office 365 being a public SaaS offering is by default accessible from anywhere, anytime and this can be problematic for some organizations. Previously, AD FS claims rules were the only method that allowed restrictions to be configured based on the IP of the user/client. With the advent of Azure AD Conditional Access and Multi-factor authentication, we now have more robust and easier to use alternatives. Let’s do a quick test of the new feature. To create a new country-based location, all you need to do is to give it a Name, and then select one or more of the countries from the dropdown control. 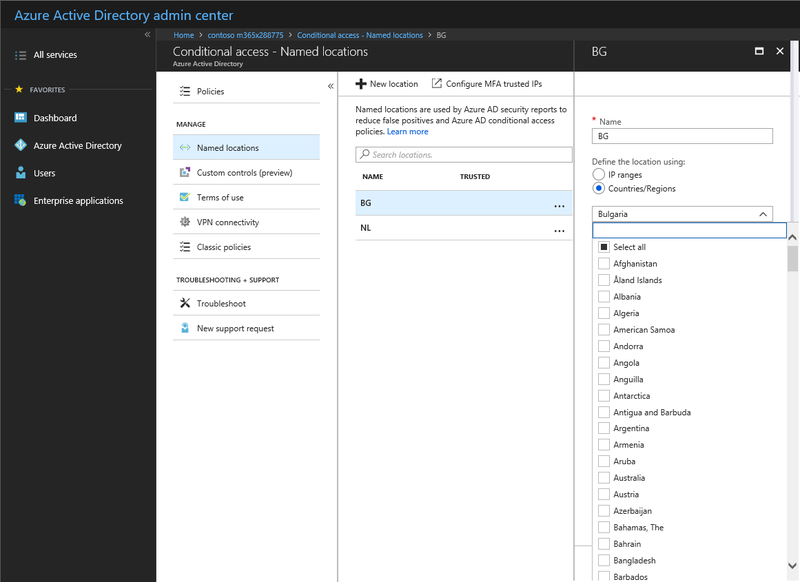 In the example above, I have already created a location that includes my country, Bulgaria, and another one that includes the Netherlands, which happens to be the country in which my Azure VMs are hosted. In effect, I’m preparing a list of “known” or “good” locations which I can then whitelist in any CA policies. It’s important to note that you cannot designate any country or group of countries as a “trusted location” directly in the settings, as one can do for IPs/ranges. You can of course approach this from the opposite angle – create a list of countries that are “bad” and any potential login attempt from those should either be blocked, or be a subject to more strict CA policy. In such scenarios, you will probably also want to check the Include unknown areas option, which will apply to any IP address that cannot be mapped to a given country. Whichever approach you select, the steps to create the named location are almost identical, and very easy to follow. As you can see from the above screenshot, any Named locations you defined will appear in the list and you can select one or more of them for each of your policies, either as included or excluded location. You can of course still create a policy that does not depend on the network location, or a policy that applies to any “uncategorized” locations as we discussed above. After selecting the appropriate controls for your policy, it’s strongly recommended to test it via the WhatIf tool and also via some real login attempts. Be warned that the IP-to-country mappings are not always correct and can actually change over time, so have that in mind when configuring and troubleshooting country-based policies. This entry was posted in Azure AD, Office 365. Bookmark the permalink. Pretty cool, though I’ve found the countries one might want to block aren’t the best at keeping track of their IP spaces. For example, earlier this year I was traveling in South America, but some of my devices were reporting in as Florida, USA. Presumably global ISPs lease address space from other countries. Thank for article, but seem like requires Enterprise Mobility + Security license or Azure AD premium to do this. Is this right? That, or Azure AD Premium, as any other Conditional access policies. except that brute force attacks are generally done using basic authentication which bypasses conditional access. while this does block successful attempts, meaning they have the password. it does nothing to stop the invalid password attempts. I would like a way to stop invalid attempts. Awesome post comrade, love the attention to detail and technical accuracy!